Temperature mapping study is described as the process of capturing the temperature ranges, documentation it and checking the variations and differences in a particular area over a specific time duration. This area can be any place such as a large warehouse, cool store, refrigerator, vehicle or shipping box. So when considering warehouse it is normally distributed among a wide area capacity, therefore, it is not an easy task to maintain the same precise temperature range in every corner of the warehouse. 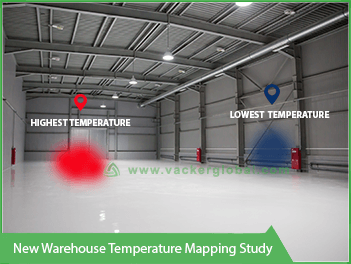 So through this mapping study, it helps to analyse and find whether the warehouse is maintaining particular temperature range or else if it is not maintaining we offer the solutions for that also. The temperature range which warehouse is maintaining will depend on many aspects such as weather conditions, seasonal climates, the location of the warehouse, air circulation systems, cooling systems of the warehouse, numbers of products stored inside the warehouse and many other things. So changes in any aspect will affect the maintenance of particular temperature level inside the warehouse. In Russian and European countries, the risk is in the winter. It is possible that during winter, the temperature will go to zero Degree Celsius damaging the medicines. In Middle East countries, during the summer season, the outside temperature will be very high up to 50 Deg C. So the warehouse owners have to maintain precise temperature range inside warehouses to avoid goods being damaged because of extreme hotness or coldness. For example, in case if the warehouse got too cold there is a chance that the products may freeze and get damaged and if the warehouse got too warm then there is a chance of goods become poisoned or unsafe to consume. So maintaining particular temperature range will not be an easy job, especially inside a large warehouse in extreme climatic conditions. 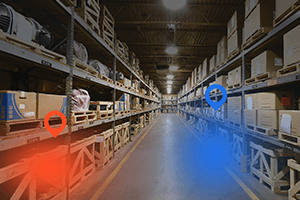 That is why a mapping study is necessary for any warehouse so then if there are some issues with the warehouse we can find the root-cause and ready to give solutions for that. How to conduct a successful mapping study for warehouse? Vackerglobal conducts all mapping studies based on WHO protocol standards. (Click to know more about our Temperature Mapping & Qualification protocols) This includes the international principles of conducting mapping study. So any customer who did mapping study from Vackerglobal will have detailed test reports from us, indicating the results of the tests. If the test results are satisfactory, the report will indicate that warehouse is maintaining permitted temperature range. Before starting the mapping study we inform the customers about the whole process through a mapping study protocol. It includes an explanation of the process from beginning to end. Specially scope of the study, the objective of the study, responsible parties for processing each task, how we conduct analysis section, areas we place the loggers and the height levels for each data loggers. Once the customer agrees to our protocols, we commence the mapping process. 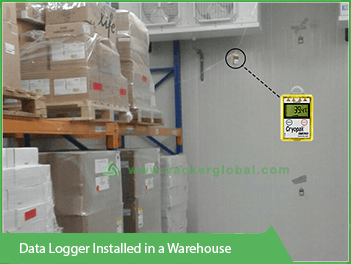 We measure the temperature range inside the warehouse using iMini temperature and humidity data loggers. Since humidity also contributes to the temperature level we generally measure both aspects of warehouses. A warehouse should maintain 15°C – 25°C temperature range and 40% - 65% RH humidity range as the precise range which is generally accepted as per WHO standards. To capture complete temperature ranges inside all corners of the warehouse with every situation we conduct mapping study during 7 -14 days. As a minimum, we have to fix data loggers and capture temperature for 7 days and maximum 14 days. This much of data will be enough to analyse temperature and humidity across the entire warehouse. During this period, we record temperature and humidity level once every 5 minutes time. We record all major events during such test period. With this data, we can get a complete graph of the temperature and humidity distribution. We conduct the mapping study mainly during loaded condition. That is because most warehouses which we conduct the mapping study will be already in loaded condition. It is not practical to unload all the goods to another place and conduct the study. And in case if it is a new warehouse we can conduct the study under empty condition. It is good to measure and ensure warehouse under an empty condition in precise temperature range before loading the goods. So all the situations which we conduct the study will depend on the condition of the warehouse. Also based on customer requirement we conduct power failure test and door opening tests for the warehouse. Under practical operating conditions, there will be too many door openings. With these tests, you can measure how the temperature level changes in each situation under different operating conditions. Depending upon the country, we may have to conduct the study under two or three climatic conditions. In many European countries, we do the tests during summer, winter and spring seasons. However, for most of the tropic countries, two seasons will be enough. In Middle East countries also two tests are sufficient. Eg. If your country has a highest temperature of 40 Deg C and a lowest temperature of -10 Deg C, it is better to carry out the tests under three climatic conditions. Once the data capturing and analysing part is completed we issue a full report about the temperature and humidity range analysis of different situations. Also, hot and cold points of the warehouse will be recommended to install continuous monitoring systems. Once all the tests are conducted satisfactorily, a certificate will be issued. As the requirements of GDP (Good Distribution Practices) is becoming more stringent for medicines and vaccines, the mapping study and qualification is becoming tougher. The challenge after conducting the mapping study is that you will see the results only after downloading the data. It might be possible that the asset (warehouse, cold room, vehicles etc.) will fail the mapping study for minor reasons. However, analysis of the results is only possible only after downloading the complete data. After carrying the necessary rectifications, we will have to repeat the mapping study. This results in the loss of money and time. In most cases, the loss of time is very important because the season will be over and they may have to wait for 8-10 months for the next season. In order to avoid these problems, we carry out a temperature mapping study and qualification using wireless data loggers. The data is available online in real time and the software for the mapping study analyses the same. So as the test progresses, we will be able to notice any failures. Sometimes the corrective action will be only changing the settings of the thermostat. In such a case, we can change the settings and restart the test immediately. There is no need to remove and replace data loggers. We can tweak the settings and see the changes in real time.